About half way through the movie I leaned over to my wife and whispered, “This is so good.” It’s not unconventional, or provocative, per se. it is predictable, but only because it’s perfect. Last Vegas has tons of diverse talent that syncs up instantly for a symphony of comic wit and sincerity that is thoroughly enjoyable from beginning to end. While I say it is predictable, that is only because it turns the only way I think it can be truly satisfying. That is not to say that the movie is not full of fun surprises and misdirection that truly pays off. I can only describe the experience as gleeful. The story is of four old friends– plaid by actors in roles designed to accentuate what makes them great: Kevin Kline, Morgan Freeman, Michael Douglas, and Robert DeNiro– who grow apart and get the gang back together 58 years after its inauguration for an unlikely bachelor party in Las Vegas. Imagine a classy, soulful, sharply comedic, heartfelt spin on the Wolf Pack that may well be superior to even the fist Hangover film. The roster for the crazy Vegas weekend includes a Florida retiree who isn’t ready to be a Florida retiree, a grandfather who’s family fusses endlessly about his health, a successful businessman in Malibu eulogizing his mentor, and his old best friend, a widower and recluse who no longer speaks to him. The movie is about all kinds of relationships, but it’s just fun to see the guys cut loose, judge a bikini contest, go clubbing, meet celebrity look-a-likes in drag, rediscover what they mean to each other and what they appreciate about their lives. I really think this film is a home run. It seems effortless the way the highs and lows come together to make a fully developed and satisfying movie experience that can be repeated. The performances are all fantastic, including Mary Steenburgen, who plays a Las Vegas lounge singer the boys become smitten with. It hits all of the tones that it should. It’s a Bachelor Party movie and what’s more, it’s set in Vegas and the scene is captured really well and the cast deftly maneuvers it with style, cunning and hilarity. I also like that much of it feature The Aria, vs. Caesar’s Palace, which is the usual. Much of the comedy of the film comes from the fantastic direction of Jon Turteltaub, who I’m sure not only informed the actors, but got some of his own jokes in from his perspective as a storyteller. I recently saw another Turteltaub film, The Kid, which stars Bruce Willis. It was a lot of fun too and Jon really knows how to direct. Writer Dan Fogelman (The Guilt Trip) is no slouch himself and these guys are in top form and collaborating with the crème de la crème of acting. 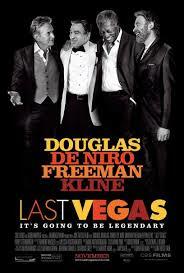 The bottom line is, Last Vegas is a well paced, disarming comedy that is deceptively heartfelt and delivers in all genres it touches on with lightning fast speed and dexterity.